The Garden has an extensive collection of plants from New Caledonia, thanks in part to the IRD (L’Institut de recherche pour le développement) which made the plants available. The Garden’s Conservatory Director, Ron Determann, was tasked with creating a tropical plant collection and chose to focus on tropical conifers. In 2003 he visited New Caledonia to learn about the ecology of their tropical conifers and about their conservation issues. 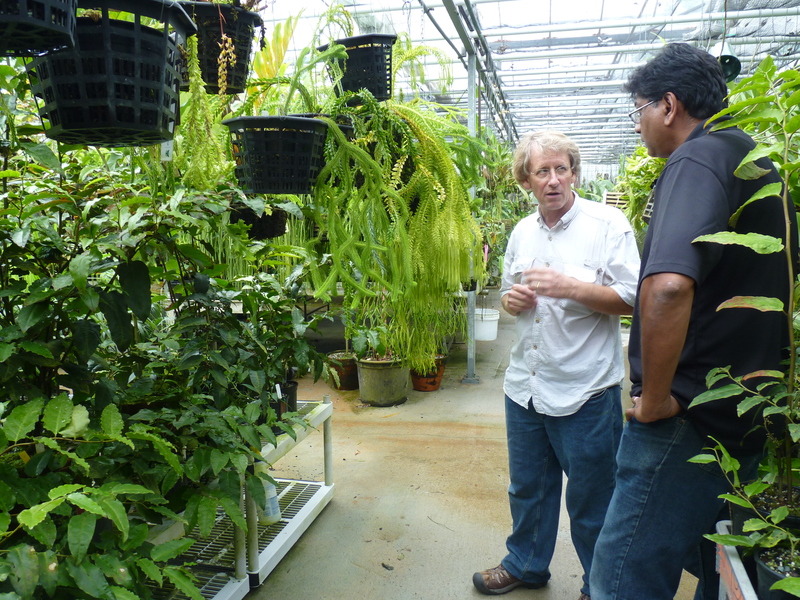 He also visited University of California at Santa Cruz, whose arboretum is home to many plant species from New Caledonia, including Amborella trichopoda. In 2005, Determann returned to New Caledonia and received cuttings, seedlings, and seeds from a sanctioned nursery. These formed the basis of the collection. As you can imagine, however, plants that grow in New Caledonia’s metal-rich, nutrient-poor soil have some unusual horticultural requirements. Determann and his team do not provide these plants with serpentine soil components. Other adjustments are made. In general, the New Caledonian plants are maladapted for regular soil and he finds that they are particularly sensitive to phosphorous. He grows most plants in highly porous soil mixtures, and other plants he treats like epiphytes, growing them in baskets, some just while they are young, and some for their whole lives. Amborella trichopoda had never been grown from seed in the United States until Determann and his team did so. Thanks to their success, Amborella has been made available to scientists at the Amborella Genome Project. 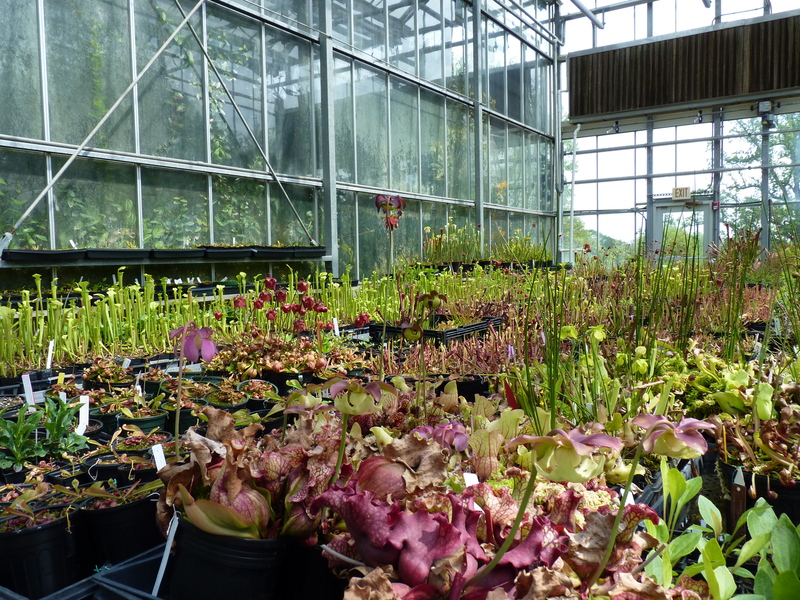 The New Caledonian plants growing in the Dorothy Chapman Fuqua Conservatory and the Garden’s greenhouses comprise just one of many living collections at the Garden. These living collections provide invaluable resources for visitors and researchers while contributing to the conservation of the Earth’s biodiversity. The plants from our living collections on public display provide learning opportunities for visitors. 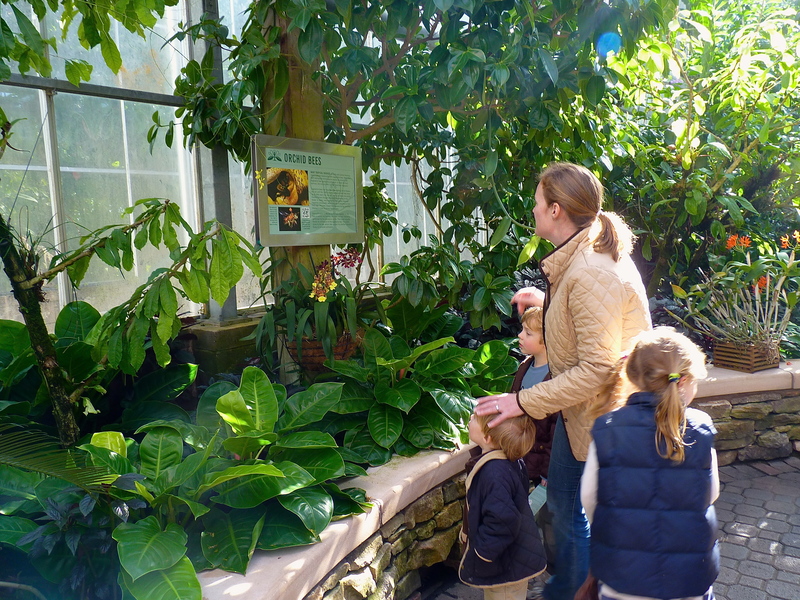 Through outreach materials, signage, guided tours, and interpretive stations, visitors can learn about plants from far-flung areas of the world as well as plant communities in our own region. Living collections enable scientists to sample plant material without having to organize expensive field trips. They also are a sustainable source of research material that takes the pressure off wild populations. Plants can be visited and sample at the garden in all stages of the life cycle, so that their flowers may be observed and their seeds examined. Researchers also have access to the Garden’s carefully kept data, which includes exactly where specific plants where originally collected and by whom. Finally, the Garden’s horticulturalists and staff taxonomist lend their considerable expertise to visiting scientists and researchers. A study conducted by the Botanic Gardens Conservation International (BCGI) indicates that roughly 9,000 species of plants threatened in the wild are flourishing in the world’s botanical gardens. While preservation of species in their natural wild habitats (in situ) is the goal, ex situ conservation collections are important to this effort, especially in the face of widespread habitat destruction. 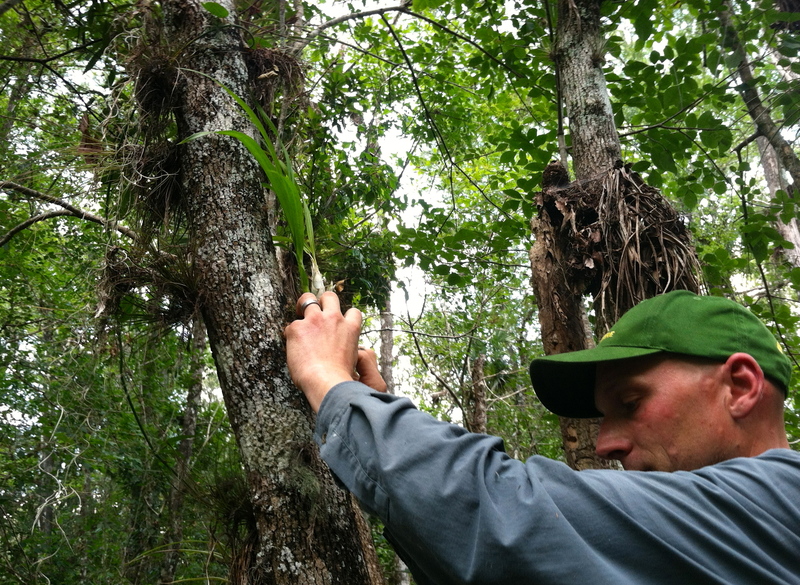 Ex situ collections provide the opportunity to study the biology of endangered plants, understand their needs, and develop plans for the restoration of their natural habitat and ultimate reintroduction. The living collections also provide an insurance policy against extinction.